Before you start, this is not by your normal correspondent. I have been meaning to write about a couple of things that have been made in the shed. Like most of the things in the shed, those best intentions never got past the design stage, but not today. Like many young people, I had a set of Scalextric when I was small. As a teenager, it got a bit bigger with some that was left over from a school fair. A job lot on e-bay added a further wedge and a closing down sale at a local shop extended the car collection. All of this sat in several boxes for many years. The last time it came out was in 2006 and then it did not really work because a) we tried to build too big a track and b) it had not been used for about fifteen years and hence needed some TLC. It went back in the boxes and life went on. Small saw the piles of boxes a while ago and asked several times if we could get out the electric cars. Well, could a dad refuse such an offer? 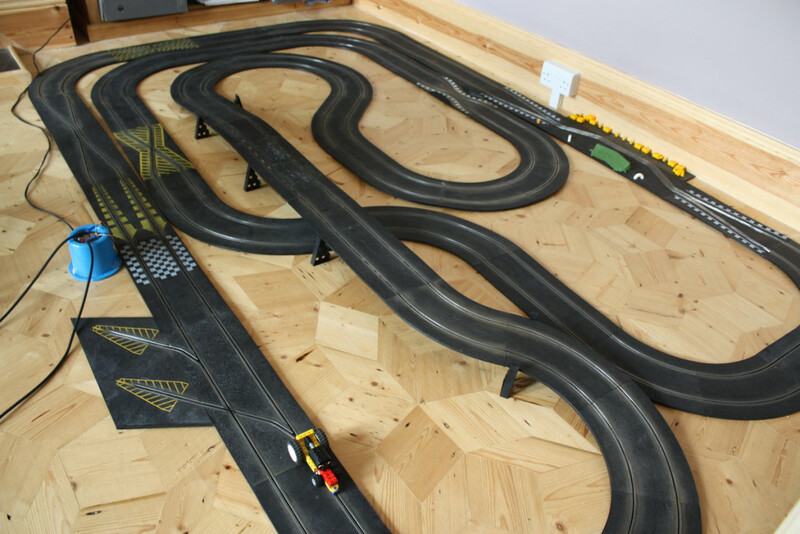 No, so last week I made a simple layout which used the best bits of the track. After a little bit of fettling of the track, the new cars from the last purchase some years ago worked spectacularly well. The only real problem was that the track got in the way of the chairs from the dining table and some friends were coming to dinner (the maths tutoring would just have to work round it, but dinner would be a bit more awkward) and this meant it got “tidied away” (put in a pile in the corner) yesterday. During the week, I had tried using the old F1 cars and the Mini Clubmans but the rubber on their tyres had dried out and had no grip. I found a dedicated bunch who supply tyres and brushes to revitalise the cars and I also ordered some of the pads to clean up the track. One of the other items that I have from childhood is a book entitled “101 Circuits for Scalextric Drivers“. Small and Tiny looked through it today declaring “wow” for all of the layouts and they settled on one that they wanted me to build (SCX.1278 if you have the book). With a bit of modification for the fact that, while I have a lot of track, the only curve types are the same radius and hence where the layout wanted four bends with smaller radius, I had to improvise. We managed and got a layout that looked about right and had the advantage that it fitted at the end of the room, mostly out of the way of the dining table. The kids helped out (surprisingly well) with cleaning the track. Their enthusiasm waned eventually but was rekindled a bit later when Small was asked to go and tidy up his Lego… We had a new layout and it worked quite well. That is all very fine, I hear you say, but what about making stuff in the shed? Well, some spare brush components, a new layout and thoughts of Lego. Surely there must be an opportunity to join the two toys up. I pottered for a bit to put together a very basic chassis and then disappeared to the shed to come up with a way of interfacing a brush unit with standard Lego pieces. I could always cut and drill things, but that would not be in the spirit of Lego, would it? In the end, the only extra that was needed was a washer to retain the spigot in the Lego brick that had a hole for a Technics joiner. 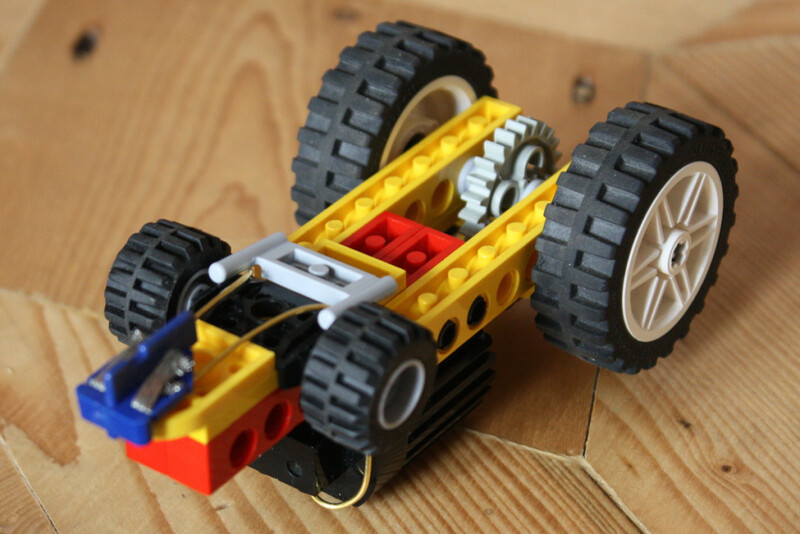 I used the 12v Lego motor which, in hindsight, has two drawbacks. 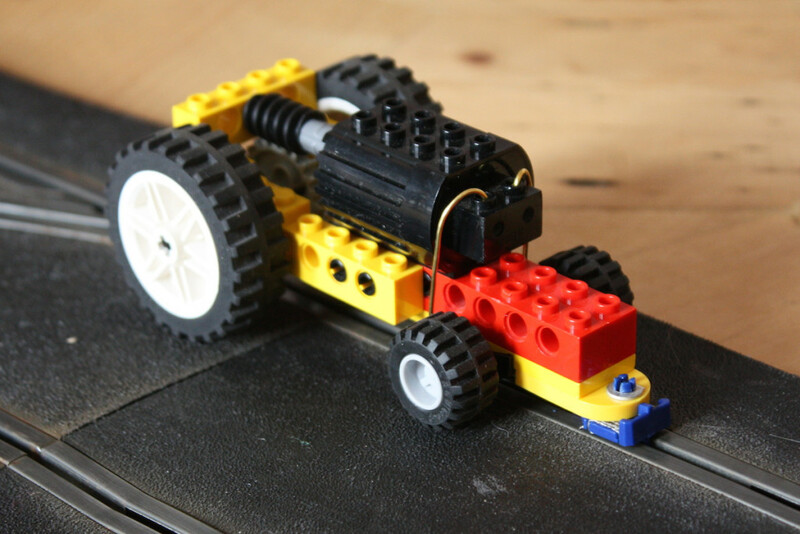 1) It has nowhere near enough torque so it is more of a tractor than a race car and 2) the orientation of the terminals on the motor mean that it travels the opposite direction round the track to a conventional Scalextric car. Ah well, I had fun doing it and seeing Small’s face light up when he saw a Lego car running round the track was worth several hours work. 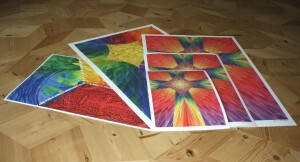 The picture below is a link to a short video if you want to see it in action. 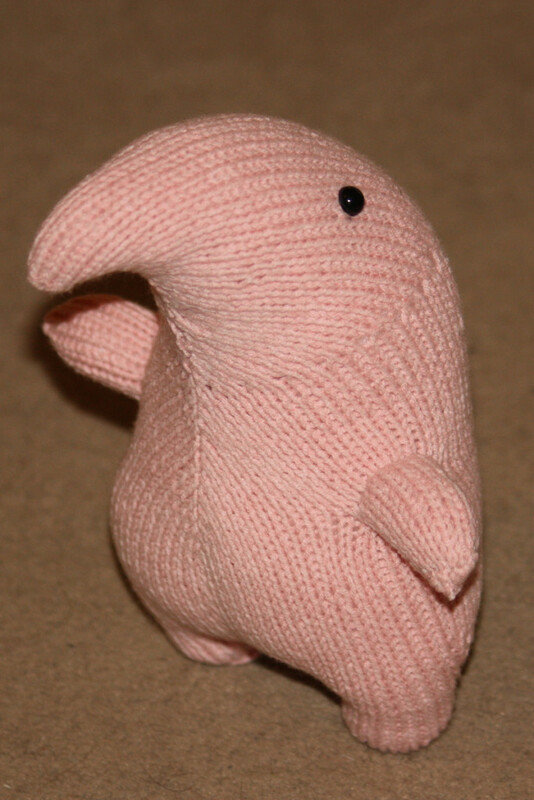 While I have been working out how to use WordPress, someone else has been getting closer to finishing off a Clanger that has been in the making for some years and really should get finished in time for Tiny’s birthday this year, so here is the obligatory picture of some knitting which is required as a fee for me getting my hands on the keyboard.